Earlier today, Nathan Mattise posted an article on the celebrations at PARC marking the 10th anniversary of its (quasi) spinoff. 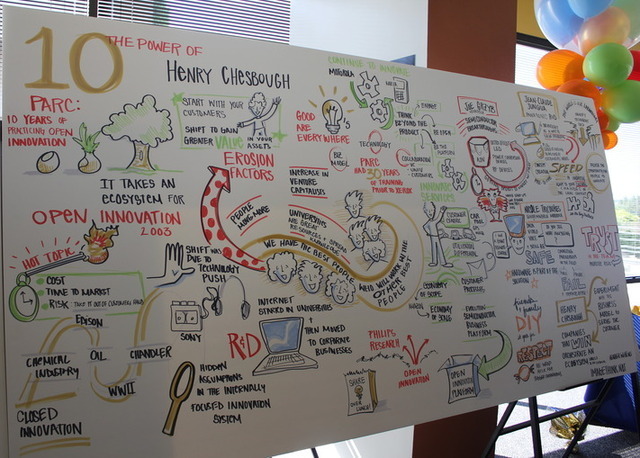 Veteran OI researchers know that OI started at PARC, with Henry Chesbrough’s research on Xerox PARC that led to Chesbrough & Rosenbloom (2002) and then his original Open Innovation book. And apparently Chesbrough gave the opening presentation Thursday afternoon at the event entitled “The Power of 10,” celebrating open innovation. I’ve made a few contributions to OI, open source and standards research, but nothing to earn a slogan with my name in it. I’m not sure how (or if) I’m going to get there, but then I don’t think Henry necessarily anticipated this outcome when he started a decade ago. I just wanted to say that submissions for the June conference on open innovation at Imperial College London are now closed. The editors are reviewing the manuscripts in hopes of meeting our self-imposed May 1 deadline for notifying people. As expected, most of the papers were from European authors, validating our decision to hold the conference in London. However, we received far more papers than expected, and the number of attendees is limited by budget and room size, so the review process will be far more difficult than anticipated. For those who did not submit, I want to reiterate a key point. While the conference is intended to develop papers for the special issue of Research Policy, papers that are accepted in the special issue will be determined by what we receive (through the RP manuscript system) by August 31. Submitting (or having accepted) a paper for the workshop is not a pre-requisite for participating in the special issue. That said, I expect that the conference papers that we are forced to reject will be those that are less well developed, or where there was not a clear effort to integrate the research design and contribution with prior research on open innovation.